Undenatured collagen administered orally works with a healthy immune system to promote healthy joints by a process called oral tolerization. This process helps the body to differentiate between foreign invaders, such as bacteria, and elements that are good for the body, such as nutrients. The process of oral tolerization takes place in the small intestine where food is absorbed. Through a complex process, lymphoid tissue in the mucosal lining of the small intestine screens incoming compounds and serves as a "switch," turning the body's immune response on or off to foreign substances, depending upon what that substance is. In the case of undenatured type II chicken collagen, small amounts (typically around 10 milligrams) taken orally have been shown to correct a faulty immune response specifically targeted at the type II collagen present in bone joint cartilage -- in effect, modulating the body's immune response so it works correctly once again. There have been a number of studies conducted with UC-II on both animals and humans, including research at the Harvard University Medical school -- all of which have shown that the undenatured type II chicken collagen found in UC-II effectively reprograms the immune system to promote healthy joints and increase joint mobility and flexibility. In a 2009 randomized, double-blind, clinical study, 40 mg of UC-II was more than two-times as effective as 1,500 mg of glucosamine + 1,200 mg of chondroitin in supporting joint health, comfort, and flexibility.1 UC-II outperformed the glucosamine/chondroitin combination using three different assessment tools: WOMAC, VAS, and Lequesne functional index. UC-II was also shown to improve quality of life. UC-II significantly decreased pain during daily activities. Some benefits of collagen supplements are improvement while walking on a flat surface, performing heavy domestic duties, ascending stairs, and while resting in bed. UC-II was also shown to be safe and well-tolerated with no known side effects. At a cost of over $17,000 per kilogram of active ingredient, UC-II is indeed an extremely expensive supplement ingredient. Fortunately, it only takes 10 mg a day of its active ingredient for the benefits of collagen to reach maximum effect. To make it clear, when we talk about a 10 mg dose, we're talking about 10 mg of active glycosylated undenatured type II chicken collagen. But there are no readily available pure sources of this component. Standard hydrolyzed chicken collagen has virtually none. And most sources of undenatured collagen offer it in the range of 10-25% concentrations. In UC-II, for example, active glycosylated undenatured type II chicken collagen comprises 25% of the whole. That means it takes 40 mg a day of UC-II to get 10 mg of active undenatured collagen. If you look at some supplements, you may notice that several of the supplement providers who are using UC-II in their formulas have mistakenly used 10 mg of UC-II itself. That means they are only providing 2.5 mg of active undenatured collagen. Given the cost, it's easy to see why, but from your perspective, you want a full 10 mg, which requires 40 mg a day of UC-II -- or more from other sources. Another differentiation is that UC-II is manufactured in a GMP- certified facility from chicken sternum cartilage using a patented, low-temperature manufacturing process that ensures a particular level of undenatured type II collagen. Other forms of type II collagen sold as dietary supplements are denatured, or hydrolyzed. (2) Trentham DE, Dynesius-Trentham RA, Orav EJ, Combitchi-D, Lorenzo C, Sewell KL, Hafler DA, Weiner HL. "Effects of Oral Administration of Type II Collagen on Rheumatoid Arthritis." Science 1993; 261:1727-1730. It's remarkable to go to see this web page and reading the views of all mates about this article, while I am also eager of getting know-how. Dr. Mark Stengler, in his book, "Natural Healing Encyclopedia" published in 2015 recommends taking 40 mg of Undenatured Collegen Type II. Which reliable companies offer this product and at what cost? Did you see this? https://www.baselinenutritionals.com/products/triple-jointed.php/. 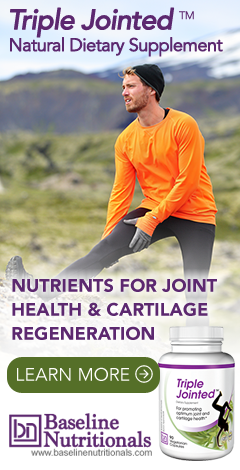 Baseline Nutritionals also uses 40 mg of UC-II® Standardized Cartilage. UC-II is extracted from chicken sternum cartilage using a patented, low-temperature process that ensures the undenatured biological activity of the type II collagen even when exposed to digestive juices for 90 minutes or more. I currently take Pentasa medication for Ulcerative Colitis. Is there any adverse effects of taking UC-II while on this medication? Will it interact? There are a large number of drugs that interact with Pentasa. Although chicken cartilage is not listed among them, you will need to check with your doctors to see if they have concerns with UC-II. I 71 and was suffering terribly with bone on bone pain and other osteoarthritis pains. Since learning of this and taking it I feel like I nothing is wrong . It's wonderful and I wish the world knew more about this little pill. It's wonderful not to endure that constant pain. This small pill has given me back the flexibility that I lost in my hands and fingers. I noticed relief within 7 to 10 days. This product works for me. I am 78 and enjoying life . I highly recommend it to others. As a helpful note, if you look under their FAQ section, they state: "Side effects with Triple Jointed are extremely rare, but the ginger in the joint formula may cause mild heartburn. If needed, try building up by starting with one capsule, then two, then three. Also, if necessary, try taking capsules with a little food."